Star Trek debuted in 1966 and has been one of the most successful science fiction entertainment franchises. Created by Gene Roddenberry the core of Star Trek has been is its six television series: The Original Series, The Animated Series, The Next Generation, Deep Space Nine, Star Trek Voyager, and Enterprise and currently eleven feature films, dozens of games, hundreds of novels, and thousands of Star Trek collectibles and memorabilia. Star Trek has become a cult phenomenon, and has even initiated the creation of the fully functional constructed language Klingon and spawned many pop culture references. Pictured right: STARSHIP ENTERPRISE-D – The hero visual effects miniature of the Starship Enterprise-D from Star Trek: The Next Generation, fiber-reinforced cast resin construction with internal neon lighting [untested] on an aluminum armature with motion control mounts, with motion-control mounting hardware, power supply box [untested] marked “obsolete” and box marked “neon lights” — 78×59½x14½in. — built by the Industrial Light and Magic Model Shop for “Encounter At Farpoint,” the pilot movie for Star Trek: The Next Generation, featured in the show’s main title sequence and in many subsequent episodes, later refurbished for its starring role in Star Trek Generations, the first movie with the Star Trek: The Next Generation cast, some lettering on the saucer has been restored subsequent to filming Star Trek Generations. Sold for $576,000 at Christies 40 Years of Star Trek: The Collection, October 2006, Rockefeller Plaza, New York. Top auction houses such as Christies and Bonhams regularly feature Star Trek items in their Film and Entertainment auctions and Christies itself featured a special 40 Years of Star Trek: The Collection auction in October 2006 at Rockefeller Plaza, New York. This auction has featured some of the most expensive Star Trek memorabilia items including the $500,000 + Starship Enterprise D model. Pictured left: A dress uniform tunic worn by James T. Kirk in “Star Trek IV: The Voyage Home” Paramount, 1986. Red wool, silk lined dress uniform with all insignia for rank and service, with leather belt with Starfleet buckle. Label sewn in inscribed “Wm S. / 4″ for William Shatner. Sold at Bonhams, Los Angeles, Nov 2005 for $8,225. For Star Trek collectors there are many themes and areas and genres that collector might concentrate on from a specific series to characters, and from original props to action figures. 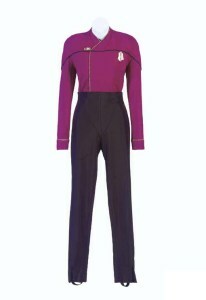 THE KATHRYN JANEWAY COLLECTION – Six costumes made for Kate Mulgrew as Captain Kathryn Janeway in Star Trek: Voyager, comprising: a Starfleet duty uniform jumpsuit with grey undershirt; a Starfleet dress uniform jacket; a Starfleet future uniform jumpsuit with future communicator from “Endgame”; a Starfleet black dress overcoat; a pair of peach pajamas and robe; and a five-piece “Jane Eyre” outfit consisting of brown and grey checked skirt and jacket, white vest, pink blouse, heavy grey knit cape and two bonnets from “Eye of the Needle”; majority with corresponding wardrobe tag. 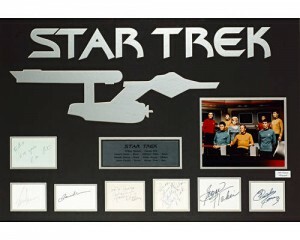 Sold for $8,400 at Christies 40 Years of Star Trek: The Collection, October 2006, Rockefeller Plaza, New York. It all started with the original Star Trek followed the interstellar adventures of James T. Kirk and the crew of an exploration vessel of a 23rd century galactic “United Federation of Planets” – the Starship Enterprise. This series debuted in 1966 and ran for three seasons on NBC, after the network rejected an initial pilot film “The Cage” with a mostly different cast, though this pilot is now routinely packaged with the original series. Following the release of other series in the franchise, the Kirk-led series was retroactively referred to as “Star Trek: The Original Series”. Pictured left: Autographs of the original cast of ‘Star Trek’, comprising William Shatner, Leonard Nimoy, James Doohan, DeForest Kelley , Michelle Nichols, George Takei and Walter Koenig on album pages custom-mounted and framed together with colour still; together with a separate page signed and inscribed by Gene Roddenberry, Live long + prosper!, the frame 69 x 99cm (27 x 39in). Sold for £600 at Bonhams, London, Nov 2005. These adventures were continued by the short-lived Star Trek: The Animated Series and six feature films. Four more television series were eventually produced, based in the same universe but following other characters: Star Trek: The Next Generation, following the crew of a new Starship Enterprise set a century after the original series; Star Trek: Deep Space Nine and Star Trek: Voyager, set contemporaneously with The Next Generation; and Star Trek: Enterprise, set before the original series, in the early days of human interstellar travel. Four additional feature films were produced, following the crew of The Next Generation, and, most recently, a 2009 movie reboot of the franchise featuring a young crew of the original Enterprise set in an alternate timeline. 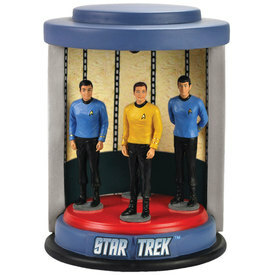 Pictured right: Crew in Transporter Lighted Figurine – The Crew In Transporter Lighted Figurine shows Kirk, Spock, and McCoy ready to beam down to the planet surface. $49.99 avilable from the Star Trek Store. Combine nearly 50 years of TV and Film history, hundreds of potential collecting themes, regular Star Trek conferences, tens of thousands of different collectables and you have a fantastic and varied collecting hobby. New items are still being produced and it is only a matter of time before we have a new series or new film to attract the ‘Next Generation’ of collectors.